My family and I used to live on a small farm. During this time I learned the importance of keeping a container of fuel on hand to run outdoor equipment and I also learned to have a better appreciation for its volatility and the wisdom of handling with care. One day I had the awful job of disposing of a small animal that had died. Instead of burying it, for fear of dogs digging it up, I decided to burn the remains. 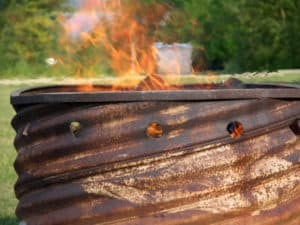 I placed the dead animal in a steel burning barrel, doused it with gasoline and was about to toss in a match when another thought crossed my mind. This might be a good time to burn that growing pile of chicken feed sacks in the barn. I blew out the match and marched off to the barn. We were raising over thirty chickens at the time and they ate a lot of feed which accounted for the mountain of paper feed sacks. I grabbed as many as I could handle and stuffed them into the burning barrel. I went back for more and kept cramming them in until the barrel was brimming over. I splashed some more gasoline onto the sacks then stood back and lit a match. If you know anything about ballistics then what happened next won’t be as shocking to you as it was to me. I tossed the match into the barrel and the trapped gas underneath the packed bags combusted like gunpowder in a giant cannon which shot the feed sacks sky high. The loud and terrifying explosion was followed by fragments of flaming feed sacks falling from the sky. After dodging the fiery debris and running around to stamp out small fires, I was left to ponder my careless use of fuel which had put me and my family in danger. In the same way, have you ever thought about entertainment as a kind of fuel that should be handled carefully? If not, you should. Media plays a large part of what fuels the hearts and minds of our generation. We mistakenly think, “it’s just entertainment” or, “it’s innocent amusement”. On the contrary, it has become one of the biggest stumbling blocks of spiritual growth and family health and is one of the most neglected subjects to be addressed from a Biblical worldview in homes and churches. The dramatic and sudden change in our society that has come about through this electronic age has unfortunately left many families in a confused stupor, wondering how to approach the subject of media in their homes. Like gasoline, it must be handled with care and we must start by finding help and direction from the Bible. Too many people have the mistaken idea that the Bible doesn’t have anything to say about the unique issues we face today. After all, where do you read in the Bible about Mp3’s, HDTV, PS3, MTV, Wii, DVD, PSP, DirecTV, or Xbox 360? What about social networks, video downloads, texting, chatting, virtual worlds, avatars, reality shows, or online gaming? These may be unique to our time but the help we need in order to navigate safely through today’s media jungle has been preserved for ages in Biblical principles. The 21st century and its escalating changes haven’t taken God by surprise. “His divine power has granted to us everything pertaining to life and godliness, through the true knowledge of Him who called us by His own glory and excellence…” (2 Peter 1:3). With such a monster of a topic, where do you begin? It must start with the heart. For over six thousand years, mankind has been faced with sin, temptations, and distractions that can take a person’s focus off of God and His plans. Electronic entertainment has brought about new conduits for temptation and time wasting but the age old battle for our hearts is nothing new. The Bible says, “…let us lay aside every weight, and the sin which so easily ensnares us, and let us run with endurance the race that is set before us, looking unto Jesus, the author and finisher of our faith…” (from Hebrews 12:1-2) No doubt, much of today’s media has become a “weight, and the sin which so easily ensnares us…” yet merely addressing the problems and issues regarding entertainment won’t solve anything that has eternal value if we miss the more important principle found in “looking unto Jesus, the author and finisher of our faith…” Our focus has to begin with a growing relationship with Him. When your goal and focus is Jesus, you don’t need a rule that says “thou shalt not run with a backpack full of rocks”. If you are running the race to win, it will be apparent that any burdensome weight or sin needs to be laid aside. Much of the garbage and toxic media that has been tolerated in homes today is symptomatic of a heart issue. The eyes are not fixed on Jesus. It has also becomes problematic because much of the media consumption today effectively distracts families from fixing their eyes on Jesus. Are you having difficulty seeing Him? Jesus said “blessed are the pure in heart for they shall see God.” Our hearts have been subtly and gradually polluted by the excessive consumption and content of entertainment. The desensitizing result continues to take its toll on spiritual growth and family health. Life doesn’t have to remain that way. Are you willing to take a deliberate break from your entertainment habits and begin to reevaluate your priorities? Are you willing to consider what has been neglected regarding your relationship with God and relationships at home? Are you willing to consider beneficial changes that may be difficult? Don’t wait for something to blow up in your home before realizing the influence, impact, and volatility of entertainment.